Don't worry, it still has butterfly doors. We already knew it was coming. Back in 2012, BMW outlined its intentions to build a droptop variant of the i8 hybrid with the reveal of the i8 Spyder Concept. Five years later, BMW has now released the first teaser of the final production i8 Spyder, now officially known as the BMW i8 Roadster. This isn’t the first time we’ve seen the i8 Roadster, however, since it’s already been spotted out in the wild several times. Showcased in a teaser video on the automaker’s Twitter page, the hybrid droptop is covered in the same camouflage we’ve seen in spy shots. Suffice to say, the German automaker is keeping details about the third member of the BMW i family closely guarded for now, but the teaser confirms that the droptop will be keeping the butterfly doors of its hardtop sibling. The only panel that isn’t hidden in the teaser is the manually removable roof, which appears to be made of fabric. Aesthetically, it looks virtually identical to the original concept, but it seems likely that it will be based on the upcoming i8 facelift model rumored to be nearly as powerful as the M3. The most notable difference is the aggressive humps behind the rear seats to accommodate the folding roof mechanisms. 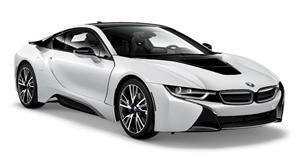 The i8 Roadster will also have an improved chassis and a bigger battery pack offering an increased range. Reports have suggested that the output has been upgraded to around 400 horsepower to compensate for the extra weight compared to the current model's 357 horsepower. "In 2018, the BMW i8 Roadster will unlock the door to a whole new dimension in pioneering open-top driving pleasure – virtually silent and with zero local emissions,” BMW said in a statement. The i8 Roadster will go on sale in early 2018 alongside the facelifted coupe, but the teaser hints that a full reveal is imminent. Don’t be surprised if it makes its public debut at the Frankfurt Auto Show this September.